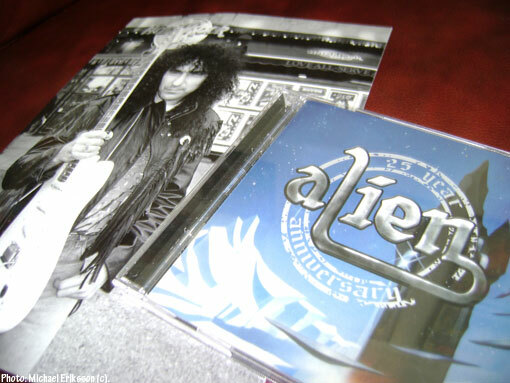 EMI in Sweden has released a 25th anniversary edition of the first album from AOR rockers Alien, originally released back in 1988. It is a double CD, that also features the full US edition. They were huge in Sweden in the summer of 1988, with “Only One Woman” going Platinum, no less. Still, there were far better songs on this album, most notably “Tears Don´t Put Out The Fire”, “I´ve Been Waiting” and “Jaime Remember”. Guitarist Tony Borg was the ringleader, the secret weapon the wonderful voice of Jim Jidhed. Hearing it now again after all these years in nice. I still got the vinyl somewhere, but until I got that hobby room going… It is very much an album of its time. I did a few interviews back in the day. Tony Borg checked out my Deep Purple collection when Alien visited Östersund. Good memories. The last time I saw him was when we did an interview at the Hard Rock Café in Stockholm, probably in 1989. The photograph you see here was taken outside the establishment. Apparently, the original band has reunited and are doing concerts again, which is good to see. I for one, would like to see them record a new album. Clearly, they have unfinished business to attend to. As do I. I will include some of the classic stuff in RETROFUTURE 7 next year. After all, the timing is obviously right. Do you remember the time when Jim left the band? What Tony said? No, but time is a healer. I just hope everything is OK.
Do you have any live footage of Alien from ’88? No. I rarely shot pictures.